In the world of high performance dirt bikes, there are five or six major manufacturers working hard each and every year spending millions of dollars and thousands of man-hours to release a machine that is better than the year before. Usually, manufacturers make small to moderate refinements yearly, releasing a brand new model every three to five years. This happens whether sales are up or down, because manufacturers know that if their customers are going to have a reason to buy a new bike in a few years, their machine had better have improved. While the next segment was originally going to be dedicated to telling you how most manufacturers treat us like red- headed stepchildren during bad financial times, by selling us virtually unchanged machines for the past six to eight model years, we decided, instead, to spend more time reminding you how dedicated Yamaha is to the sport ATV market. First, Yamaha was the first major manufacturer to release a 450cc class high performance ATV with the YFZ450 in 2003. That machine was significantly improved in 2005; then again in 2006. In 2009, Yamaha became the only manufacturer to take what they had learned from their first-generation 450, and apply it to an all-new second-generation machine–– the track width, fuel injected YFZ450R. Over the next four model years, Yamaha made minor improvements to the new YFZR, now in its fifth year of production; while its competitors continue to stall, Yamaha has been developing an impressive list of updates for the 2014 YFZ450R. For those of us who remain dedicated to sport and high-performance ATVs regardless of the times, Yamaha has given us a reason to sit up and take notice. Heading into 2014, the YFZ450R just came off back-to-back AMA National Pro motocross championships. Along with five Quad X championships, Yamaha offered trackside support in both of these series, in addition to supporting GNCC University. Yamaha’s racing programs seem to provide as much assistance for the R&D guys back in the lab as they do for racers at the track, as this year’s updates are as big a deal for the racer as they are for the recreational rider. For 2014, Yamaha wanted more power out of the YFZR’s engine, with a focus on improving the machine’s low-end hit. For 2014, Yamaha wanted more power out of the YFZR’s engine, with a focus on improving the machine’s low-end hit. To achieve this, Yamaha bumped the compression from 11.6:1 to 11.8:1, changed the cam profiles, and installed a new throttle valve. Yamaha tied all the horsepower improvements together with a new ECU complete with a new fuel map and a new exhaust designed to enhance power throughout the midrange and top-end. The titanium valve motor was developed from the start with a gnarly transmission and crank assembly, to hold up under the demands of a high horsepower race modification. That was smart, considering all of the power enhancing performance mods Yamaha offers through their extensive GYTR catalog.For 2014, the engine’s durability was further enhanced thanks to a new .25mm longer connecting rod and big end bearing. Perhaps the biggest news on the 2014 model YFZR is the addition of Yamaha’s new A&S clutch. While quite expensive, Hinson Racing’s slipper clutches have become popular among top racers as they allow the rear suspension to track much better and more fluidly through rough sections while not on the gas.Yamaha’s A&S clutch is a prime example of where the company has taken what they have learned on the track and applied it to their production machines. Yamaha matched up its hybrid cast aluminum and steel chassis with a new set of lighter KYB shocks, featuring revised settings for 2014. Yamaha’s goal with the new shocks was to increase compliance over small bumps, without losing bottoming resistance. The front shock’s length was increased by 2mm, although travel numbers remain ample and unchanged with 9.8 inches up front and 11 inches of travel out back.The fully adjustable shocks feature preload, high and low-speed compression, and rebound damping adjustments.The new shocks retain the Kashima coating, which was added a couple years back to decrease friction and increase durability. Yamaha’s goal with the new shocks was to increase compliance over small bumps, without losing bottoming resistance. Yamaha’s R&D guys felt that the bump absorption qualities of new Maxxis radial tires play a big role in improving the ride of 2014 YFZR. The 21×7-10 fronts and 20×10-9 rears are the same size as previous years. The front tires’ revised tread pattern was designed to enhance steering precision, while the new rear tread is claimed to enhance straight line traction with improved sliding characteristics. Yamaha has offered a lot of ergonomic comfort and adjustability in the past with its four position, adjustable handlebar clamps and massive 2.6 -inch wide foot pegs.For 2014, Yamaha opened up the cockpit and closed off the upper, front frame rails with side covers that extend below them. This was a problem area for our machine’s looks and our rider’s knees on our last long term test unit. Moving the front fenders forward 30mm, the flatter profile rear fenders down 10mm, and moving the foot wells back 30mm all add up to more room for the rider to work.The addition of quick release fasteners to the standard model YFZR means easier maintenance and faster cleanup for all YFZR pilots in 2014. Yamaha invited us out to the Ranch Motocross Park located in Anza, California. The track was littered with tabletops, rhythm sections, and doubles of all sizes to put the new YFZR to the test. This year’s subtle changes in ergonomics and styling do indeed build upon the YFZR’s already excellent comfort. The smoothed out seat-to-rear fender transition makes moving around easier when riding aggressively, providing a more seamless feel across the back of the machine.The revised side covers, covering the forward part of the upper frame rails, feel far better on the knees when you tuck forward and in for tight turns. Taller riders will appreciate the more spacious cockpit. The smoothed out seat-to-rear fender transition makes moving around easier when riding aggressively, providing a more seamless feel across the back of the machine. The sand track produced less traction and more rolling resistance than the clay-based tracks to which we were accustomed. This made fully appreciating Yamaha’s motor changes more difficult. We felt the power level and delivery felt very similar to previous models, which is good considering Yamaha was partially working to overcome more stringent EPA requirements for 2014. The YFZR has a smooth, progressive power band that continues building power as you feed it the gas. It never really hits or explodes at a given RPM, although it is willing to rip the rear tires loose if you grab a handful. Low-end power is good, although like most 450s, it feels a little jittery when lugging the engine, unlike the Raptor 700, which will happily idle around. 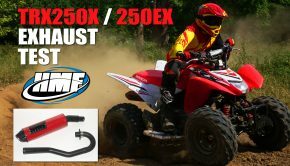 Aside from the EPA restrictions, the YFZ450R has a race motor with excellent throttle response and a willingness to rev quickly. 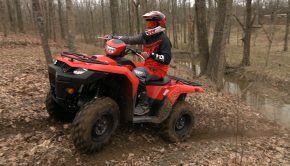 The YFZR is a trail worthy machine, but aside from the EPA restrictions, it has a race motor with excellent throttle response and a willingness to rev quickly. It pulls smoothly and strongly from the upper bottom end up into the top end, tapering off before the rev limiter kicks in. We had the chance to ride a fully decked out GYTR-equipped model with all of Yamaha’s available internal and external performance engine parts, and found it to be extremely potent yet surprisingly rideable. We suspect that the 2014 will be much like the 2013 and simply adding Yamaha’s GYTR exhaust and Power Commander will make the machine considerably faster and easier to ride than stock, providing all the power most local racers will require. The A&S clutch performs as advertised, providing a reduction in the amount of pressure needed to pull in the clutch. The A&S clutch performs as advertised, providing a reduction in the amount of pressure needed to pull in the clutch. One or two fingers are all you need to pull in the lever throughout a long moto. The slipper function of the clutch was a little less dramatic than we expected, which is good if you like to use engine braking to your advantage. Riders who have used Hinson Racing’s slipper clutch assembly feel that the Yamaha clutch doesn’t offer the same level of engine braking reduction. The sand offers a small loss in engine braking due to less traction and more rolling resistance.We believe the additional traction of a clay-based track will better demonstrate the slipper effect and benefit of the A&S clutch, something we’ll explore in greater detail when we get our long-term test unit. Yamaha went in the right direction with its suspension this year. We felt the shocks offered good adjustability in the past, although their overall action was a little on the firm side and, frankly, it still is. If you like your suspension to feel firm and crisp, then you will still like the YFZR’s shocks.Riders who wanted more plushness through chop, braking, and acceleration bumps in the past, will be a little happier with this year’s suspension.What’s better is that their enhanced small bump absorption comes with no detectable drawbacks. They continue to offer good bottoming resistance and keep body roll well under control during aggressive cornering. Riders who wanted more plushness through chop, braking, and acceleration bumps in the past, will be a little happier with this year’s suspension. Beyond enhancing the performance of the stock 2014, the new shocks had no problem standing up to the fully upgraded GYTR motor. Riders in the 170-210 pound range could easily be competitive at most local races with these shocks. Try setting them up before you spend $2,500 on aftermarket shocks. You might be surprised how good they are. Stability on the YFZR is rock solid with its track spec 48.8-inch width and 50-inch wheelbase. It launches straight out of the hole and off jumps. High-speed stability is good even in the rough stuff and it feels planted in turns, even with its stock 20 rear tires. 18-inch rear tires are the standard size for motocross. Stability on the YFZR is rock solid with its track spec 48.8-inch width and 50-inch wheelbase. The new Maxxis tires were built to be trail friendly with their 20-inch rear the 21-inch front heights.This tire size is a real asset if you plan on riding your YFZR anywhere besides a motocross track. 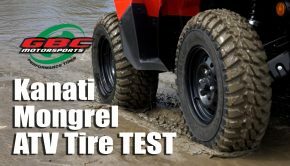 In spite of their trail friendly size, they worked well on the sand-based track and the rears could also provide a potential MX tire for muddy conditions.Overall, they offer good, dual sport performance. This year’s suggested retail of $8,799, has crept up $200 from last year. We feel this year’s improvements sort-of justify the price increase. The YFZ450R is the only second-generation 450cc machine in existence. The updates to the 2014 model represents a higher level of refinement for Yamaha’s second-generation than any of the other manufacturers have made on their first-generation machines. If you’re considering buying a 46-inch wide model and making it track width, that’ll set you back at least $2500 in chassis parts and suspension work. If you’re considering buying a 46-inch wide model and making it track width, that’ll set you back at least $2500 in chassis parts and suspension work. Purchasing and widening a used machine may wind up costing you more than a brand new YFZ450R.Based on over a year’s worth of hard riding on a previous model, we can attest to the robust build quality of this machine. The new clutch is the only part of the machine that hasn’t seen long term testing, although we don’t expect any issues from it. It’s also good to know that purchasing this machine keeps American workers in Yamaha’s Newnan, Georgia plant busy building machines, which is good for our economy. Yamaha is leaving the competition in the dust with the 2014 YFZ450R. Their dedication to continuously improving and updating the YFZ gives repeat customers a reason to justify buying a new machine. Their constant progression also gives disgruntled loyalists from other brands a reason to jump ship and, “ride blue” in 2014! 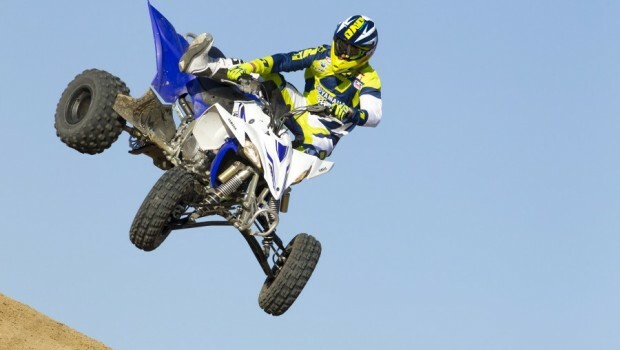 Summary: Yamaha is leaving the competition in the dust with the 2014 YFZ450R. Their dedication to continuously improving and updating the YFZ gives repeat customers a reason to justify buying a new machine. Their constant progression also gives disgruntled loyalists from other brands a reason to jump ship and, “ride blue” in 2014!